No, I am not trying to keep up with the Jones, never have and they are way out of my league anyway, but I do try to stay a little current with fashion and decor trends and design. Now most trends I pass on, but there are a few that are harmless, so I dabble in them a little. For a long time the ivy topiary ruled and was king, but lately he looks a little dated. The new kid on the block is a little miniature tree. There's only one problem, price. If you've priced one of these little gems, then you know that $30 doesn't buy much, so I thought maybe I could just make one. A couple of little bunches of greenery from Michael's on sale for $7 and a stick from the yard and I think it will pass. All I did was push all the greenery to the ends of each stem, cut off the excess wire then wrap all the wire stems together tightly and wire to my stick. I filled in the bottom with a few that I hot glued. I also added a little more white to the shelf and hung two white plates. Just changing things up a bit. I love this fabulous french script rooster runner, what a fun gift from a dear friend. I love using greenery and the little pots are fabulous fillers and accents for all kinds of arrangements. You can see a tutorial for creating a variety of little "greenery gems" here. So, what do you think, does it pass? See you tomorrow for Inspire Me Tuesday. I can't wait to see what you've been up to. Marty, your little tree loos terrific - thought that you bought it. Everything looks so good. It's expensive to keep up with all the changes in decorating - we just have to change what we have around a little and you do a wonderful job. Marty - you tree definitely passes!! 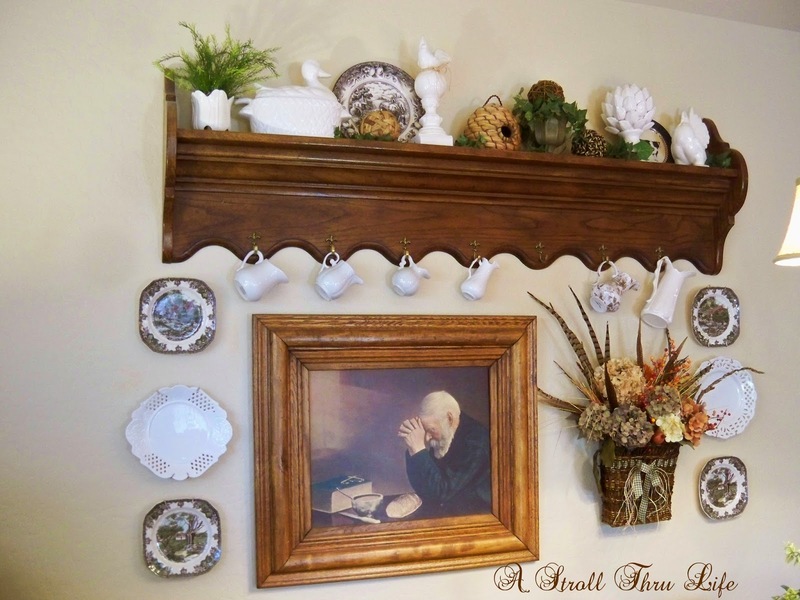 Great job - I love the additions to the shelf as well - your home always looks lovely! Yep, you pass with flying colors! The little tree looks wonderful and I love that it's all wispy! Your shelf always looks so nice and I especially like how you've dressed her now! I love the grain sack Marty! The runner is gorgeous too! Your runner is so pretty, Marty! The topiary tree turned out wonderful! I think the whole table display looks very nice!! A great welcome to Spring. It looks great!!! I love your runner too! Such a pretty tablescape! It looks great, Marty! I love that runner too! What a sweet gift. Everything looks so nice and fresh. Your so gifted with making your own greenery Marty, wish I could do something like that! They are beautiful and is always refreshing in any room! Love your little tree, Marty! I think you did a great job with it. Your tree looks great, Marty! Topiary, moss balls, succulents... who can keep up? Terrific when you can do it on the cheap! Love your wee topiary update. It was so easy wasn't it?? Your table vignette looks lovely. I love your creation Marti. I know these things can be so pricey and frankly, I can't keep buying. In fact I've put my budget on a strict diet, but when you can make it for a fraction of the cost, I think that is being a good caretaker of your budget. You did a great job and it looks great on your spring table. Very pretty Marty, I'd love to make one myself, just today I was looking to some lovely topiarys with mother; but so expensive! I love your vignette, you are so talented and creative sweet lady! Luv ya! Your tree looks like a million bucks! I love this! I have always been a topiary fan, but you're right, they look a little tired lately unless, I think, a house is completely in keeping with them style wise. It's long past time for me to part with a few I still have. Real ones, on the other hand, I will always love. 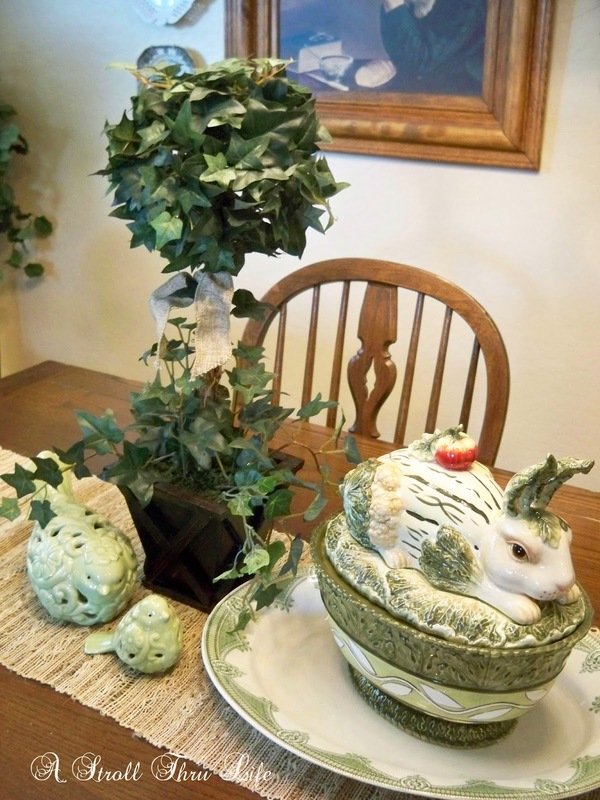 I think yours is a great addition to your table, and the bunny is great, too. I love your little tree. It looks fantastic. I never would have known you hadn't bought it. I thought u bought it:) Great job Marty! Cute topiary, Marty and I love your spring vignette and the runner. 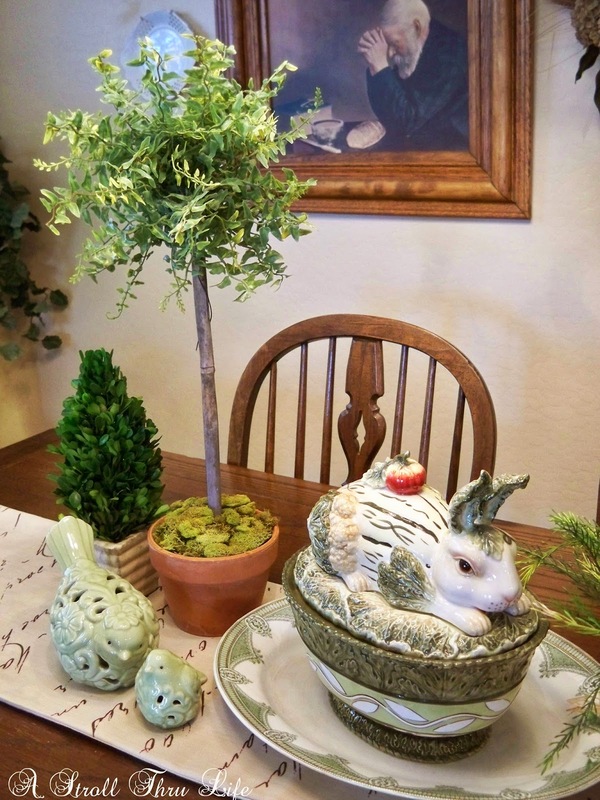 Marty, The little tree is adorable and I love the bunny dish. I did the same -- only mine were balls -- mossy balls. And they were easy! Love yours! Looks good where you put it. Your tree is awesome, Marty! How clever. I agree on the prices. I'm also loving your bunny soup tureen, very cute! You did a fabulous job with that little tree. How clever of you! 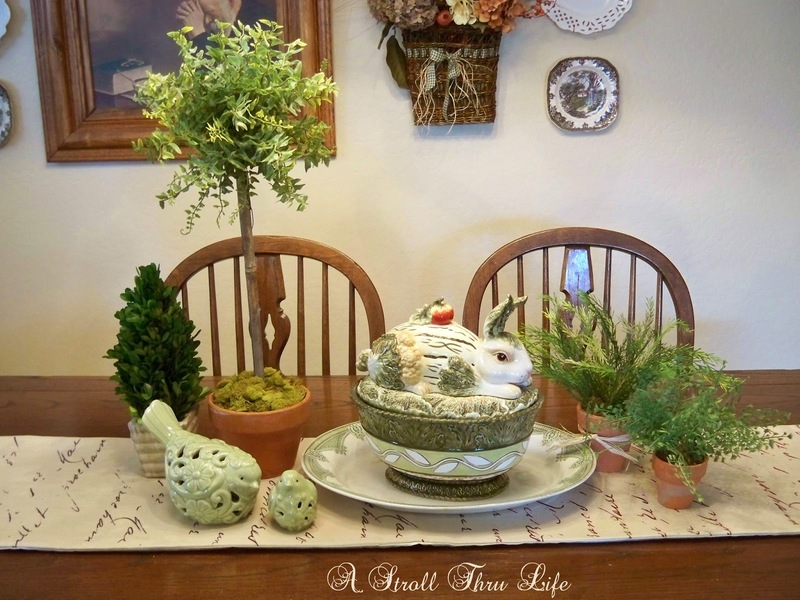 That table looks lovely and ready for spring; the runner and bunny are perfect. Fabulous job on the topiary Marty...I LOVE the whole vignette...so pretty and springy! Yes, it does more than pass! It looks amazing. The "stick" from your yard is perfect, also. The greenery at the base finishes off this faux greenery very nicely. And, you don't have to water it. Love your little tree, Marty. The other little pots of greenery and your added white pieces are so pretty, too. I love the tablescape, the rabbit casserole dish is wonderful. I must start thinking about some Easter images. Your table and wall decor look great! Love the greenery and your pretty runner too. What a great bunny dish. Your bushy tree topiary is wonderful. I would never have guessed it was homemade! Very cute, Marty. I always assumed that I'd need a styrofoam ball to make a topiary, but I like your method much better! I love all the pops of fresh green! The plates look great too! You did a great job on your mini tree! Cute little topiary. I love the French script rooster runner!!! 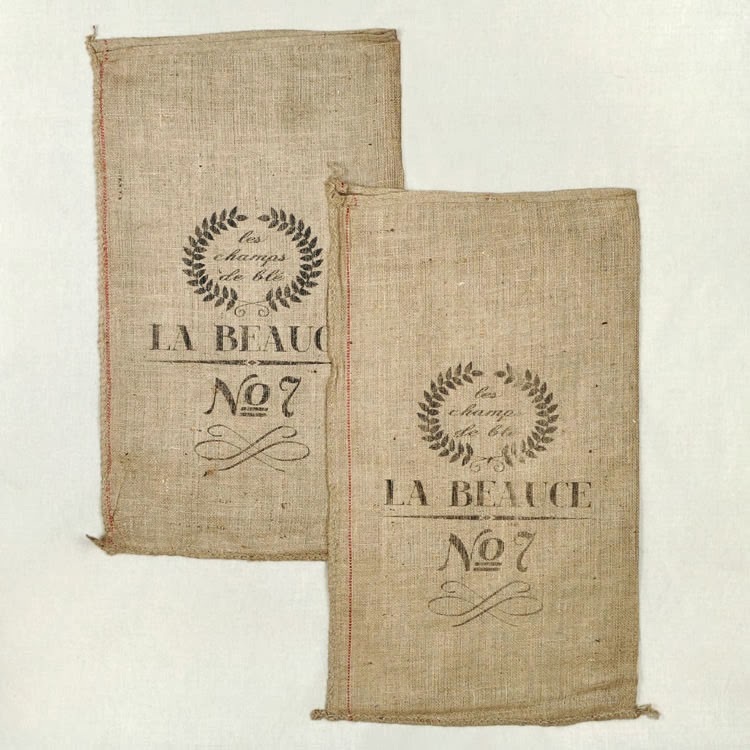 I would love to win one of the French grain sacks. Oh, dear friend. . .I am in L O V E with your airy topiary!!! I had two which literary fell apart last Autumn. I felt I had well received years of service for the amount I paid! Now, I'm wanting to replace them and the price has nearly tripled!! Thank you for encouraging me to try my hand at making one!!! Your tablescape is very pretty, Marty! I really like your idea for the topiary. I know I've almost had a coronary over the prices of some of those ready-made ones. 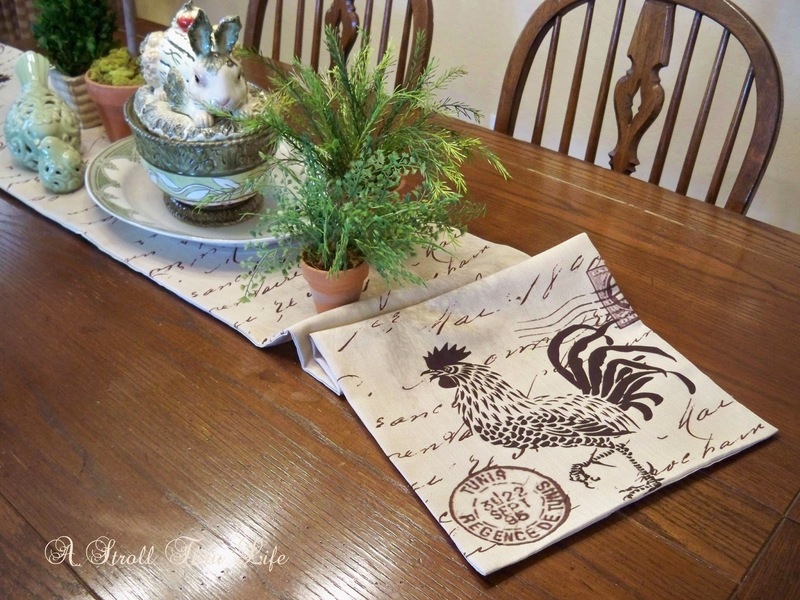 Oh, and that table runner is just adorable! Did you use a styrofoam ball on the end of the stick???? 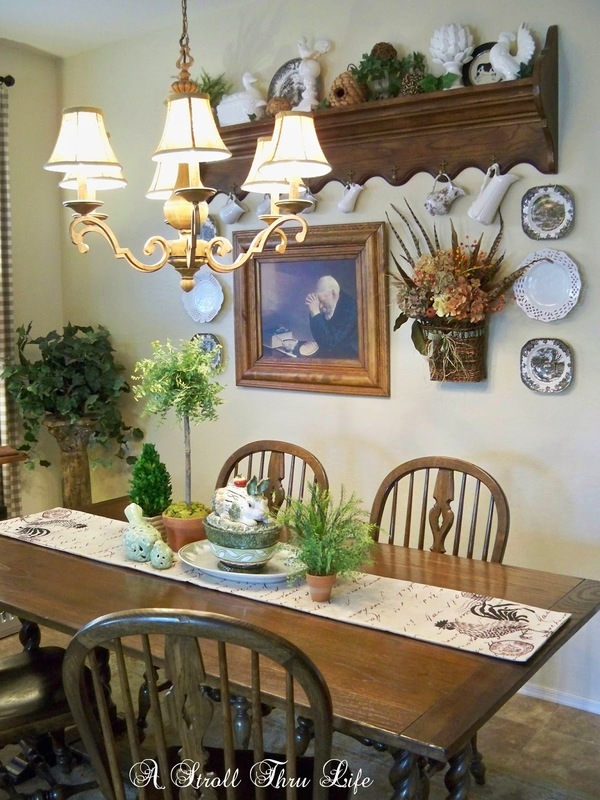 I LOVE that runner and tureen, just beautiful!!! !